Retired from the principal’s position at Bucklands Beach Intermediate School at the end of 2008. Previously held the principal’s position at two urban primary schools. Gained leadership experience early in his career leading a sole charge and a two-teacher school. Established his own consultancy company, FoxED Education Consultants Ltd, in conjunction with his wife, Robyn, who has also had an extensive and significant career in education. Queen’s Service Medal for services to education. Associate of the New Zealand Principals’ Federation. Distinguished Fellow Award – Auckland Primary Principals’ Association. 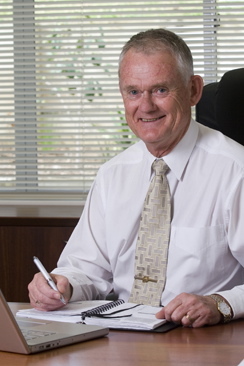 Past President, Auckland Primary Principals’ Association. Keynote speaker and workshop presenter at many educational conferences in NZ and overseas. Support provided primarily in the following areas. Statutory interventions in schools, LSM/ Commissioner. A briefing with the Board to clarify and understand requirements. Development of a time line for the appointment process. Developing application packs for potential candidates, including application forms and referee forms. Receiving and responding to requests for application packs and information. Receiving applications electronically or through a secure PO Box. Receiving referee reports ensuring confidentiality. Reviewing CVs and accompanying documentation. Preparing summary notes on each applicant. Preparing a recommended ‘long short list’ for the board to consider. Facilitating a meeting with the Board to shortlist applicants. Conducting reference checks for each shortlisted applicant. Contacting short-listed applicants regarding interview details. Preparing documentation for the interview process. Assisting during the interview process. At all stages board members retain control over the final decision-making. Initial meeting with the Board Chair and the Principal to confirm the process for the appraisal. Assisting with the development of a Performance Agreement. Assisting with the setting of Goals to ensure the Professional Standards for Principals and also the Standards for the Teaching Profession are met. Working with the Principal to determine how ‘evidence’ is to be gathered. Ongoing visits throughout the year to monitor progress against goals set. Ensuring a range of data is gathered from a number of sources including interviews and/or surveys with relevant persons. Collating information gathered and writing the Appraisal Report. Facilitating a meeting with the Board Chair and the Principal to present the final report. Preparing a ‘summary’ report for presentation to the whole Board.